Have you ever wished you had a tough contraption that can help you imprint a bunch of cheeky logos ‘n’ motifs on your collection of T-shirts? Well, if the answer is ‘yes’, have we got a mighty electrical apparatus for ye! The name’s the heat press machine, or simply ‘heat press’, and this piece o’ technology is meant to do one thing and one thing only- print cool (and possibly somewhat rude) phrases, pictures and logos on shirts and other pieces of apparel! Since wearing a T-shirt can be much more than covering your body, many folks opt to decorate their respective clothing items with certain messages and motifs. That being said, finding exactly the kind of T-shirt that will fit both your body and the sense of style can be a pretty tough job, indeed. In order to make a number of high-quality shirt designs of your own liking, you’re going to need a certain machine to do it, and we just happen to have compiled a list of the 12 best heat-press machines around. How convenient, huh? Right then, before we start, let’s have a brief overview of these magnificent wonders of technology, and see what makes them so great. What can it be used for? – Although they all work on pretty much the same exact principle, that is, applying hot platen to a surface to alter its appearance (hopefully for the better), heat presses have a rather wide variety of uses. Typically, these contraptions are used to make imprints on shirts and clothing in general, but they can also be used for decorating mugs, caps, and even some jigsaw puzzles for good measure! The types of heat presses – Heat presses fall into either of the two major categories: 1) flatbed heat press, and 2) rotary heat press. The types of heat presses (according to their degree of autonomy, so to speak) – Heat presses, much like rifles, come in three different shapes: manual, semi-automatic, and automatic. Manual and automatic-style presses are most widely used, but the new, semi-automatic version of these is also slowly becoming popular in the recent years. Now, without further ado, let’s see the top 12 picks for the category of heat press machines! Remember, each of these has some strong and some weak points, so read on and find the best model for you! Featuring a simple construction and an appearance of an alien bug from a sci-fi flick, this plucky heat press is perfectly capable of imprinting whatever design you can think up with notable ease. All you need to do, really, is set the parameters to your own liking and then use the handle to clamp down the top part for some instant results! Since its working principle is so easy to grasp, this model can be a perfect option for rookies, and, generally, folks who don’t have much experience with these types of tools. The temperature – First of all, we should point out that the temperature range for this particular model goes from 0 – 699 degrees Fahrenheit, which is more than enough to cover the imprinting process for T-shirts and other pieces of apparel. The timer – Also included in the list of features for this machine is the easy-to-use timer. This little bugger offers you a range of 0 – 999 seconds, leaving you plenty of room to adjust the optimal time for the heat transfer process. Electronically-managed time and heat parameters – When it comes to setting up this model from Fancierstudio, the whole process has been fully automated, and it can be set up electronically. This means you don’t have to be a heat press expert to successfully organize your imprinting routine, which is great news for beginners! The board – Since it’s well-known for its excellent heat-resisting properties, the material used to make the board of this model was chosen to be silicone. So, even if you chose to go with the highest temperature available – 699 degrees Fahrenheit, you can rest assured that this tough machine will survive the imprint and deliver you the wanted results every time! If you’re on a lookout for a multipurpose contraption that can turn your ordinary NON-imprinted T-shirts into an impressive new breed of visually-pleasing pieces of apparel, the F2C’s new heat press machine might be just what you need! CE-certified – For all of you who are worried about the health and safety aspects of this machine, we’ll have you know that it comes with the coveted CE certification. For the record, the CE mark stands for “Conformité Européene”- a French phrase that translates into ‘European Conformity’. 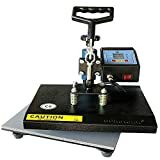 Products with this certification have passed rigorous tests in the department of the handling and overall safety of a product, so having a heat press that carries one of these marks is surely a great plus, especially for a rookie. The timer – The time interval for this machine can be set to go from 0 – 999 seconds, which leaves you plenty of options to make all kinds of designs. Of course, you’ll have to match the timing with the right temperature lest you end up with a burnt T-shirt or a poorly-decorated mug! Different selectable metric systems – Another interesting feature of this F2C combo model is that you can choose between the European and American metric systems for the temperature control! This is not necessarily the most important benefit of this design, but it certainly can be useful, especially if you’re not good at maths. 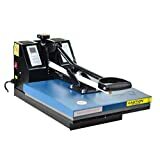 Another model from the F2C folks comes in the shape of the 5-in-1 Professional Digital Heat Press Machine. Construction-wise, this particular tool is rather similar to the model above, with only a couple of features that are notably different. For example, this version enables you to perform 5 different functions, which is exactly one less in comparison to the Combo Heat Machine you saw earlier. That being said, the F2C Professional Digital Heat Press is still a force to be reckoned with as it packs a powerful pressing punch and is capable of delivering finished imprinted products without requiring much effort on your part! What’s not to love here? Teflon-coated heating element – Since heating temperatures on this model can reach values of up to 430 degrees Fahrenheit, the manufacturers decided to equip this model with a durable Teflon coating. This is the same material that is often used on frying pans and similar contraptions, so you can imagine that it would perform pretty well as the protective layer on a heat press. The temperature – With a generous temperature range that goes from 30 – 430 degrees Fahrenheit, this press allows you to perform a variety of imprinting tasks without the risk of damaging the object you’re trying to decorate. Combined with the inbuilt timer, this range of temperature options really gives you plenty of space for experimenting! The timer – Similarly to the models we already described in the previous entries, the F2C 5-in-1 professional digital heat press offers you a timer that goes from 0 – 999 seconds. 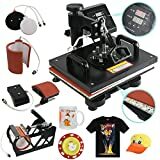 This range was put in place so that you can easily make imprints on a variety of objects such as T-shirts, mugs, plates and other items badly in need of a designer’s touch. Swing-away design – As we mentioned in the paragraphs above, flat-surfaced heat presses can work on the principle of the swing-away top part, so to speak, rather than using the clamp-on design. This gives you more room for maneuvering, as the top part has 360 degrees of rotating potential. If you happen to run a souvenir shop or just like to make fine imprints on a bunch of mugs ‘n’ T-shirts, having one of these digital heat press machines from the ShareProfit folks may be an excellent solution for you! With its 1400 Watts of sheer heating power, this tough-looking contraption can help you produce loads upon loads of sales-worthy merchandise without breaking a sweat. Also, there are multiple attachments available for this model, so you can easily switch between them so that you can create another line of products when you get bored of the first one! The temperature – When it comes to this model’s temperature range, it goes from about 32 – 480 degrees Fahrenheit. So, there’ll be plenty of room for changing up the gear and modifying different attachments, knowing that you can set the appropriate temperature for each and every one of them. Rubber Grip – Since this digital press is operated by hand, it’d be important to mention that the manufacturers cared enough to equip it with a rubber grip. Manually operating a heat press can be a long process and the last thing you need to greet you at the start of a long work day is a crummy handle that will make your hands all sore and blistery. Digital LCD – To help you track your parameters in an easy way, the digital LCD has been put in place, so that you can observe and set the time and temperature before proceeding with the imprinting process. Swing-away design – Another great thing about the construction of this heat press is its convenient and easy-to-use swing-away design. Thanks to this particular perk, you can change the objects of imprinting or, indeed, the attachments in a jiffy! 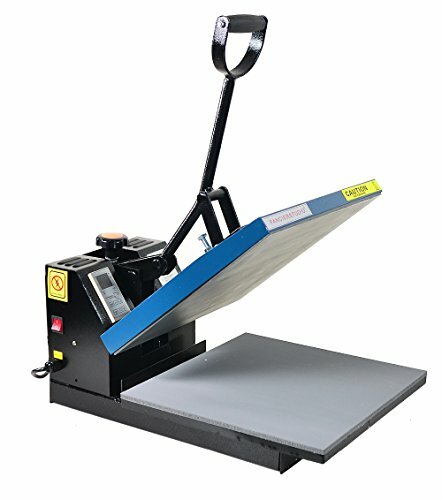 Possessing roughly the same characteristics as the model from above, the ShareProfit 6-in-1 Digital Heat Press only differs from the fact that it supports 6 attachments rather than 5 that the model above can pull off. Also, this particular model is somewhat less powerful than its older brother, as it is capable of mustering only about a 1,000 Watts. (The other model has 1,400 Watts, for comparison’s sake) Surprisingly, though, the price remains pretty much the same, so if you already like the parameters of the model described above, you should definitely check out this model, as well! The 6 attachments – Surely by far the biggest asset of this particular model, the 6 different attachments that you get allow you to really explore the capabilities of this machine and make some impressive designs of your own. The attachments are as follows: 1) a platen press, 2) hat/cap press, 3) mug press 1, 4) mug press 2, 5) plate press 1, and 6) plate press 2. So, plenty of options to choose from here. Teflon-coated heating element – As we already mentioned, Teflon is a material with excellent heat-resistance properties. Therefore, the fact that the heating element of this press has this particular material as a protective layer means that the whole contraption will last longer, and give you better results when you actually set out to do some imprinting work. Lovely stuff, indeed! Sizeable working surface – Possibly the biggest pet peeve that customers have with heat presses would be the small working surface. With this model, however, this won’t be a problem, as the ShareProfit folks surely spared no expense to make their machine top tier, in this aspect, at least. So, no matter how chunky your T-shirt of choice is, you can rest assured knowing that this machine will be able to take care of it! 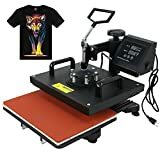 Small in size and rocking an interesting construction incorporating the elements of both swing-away and clamp-down designs, the ePhotoinc Swing-away T-shirt Heat Press Machine is a breeze to use, even if you’re are a complete and utter rookie. What’s more, it’s compact built makes chunks it right into the lightweight category (according to unofficial heat press standards, that is), as the entire thing, which comes preassembled, by the way, weighs just above 30 pounds! Great stuff so far, let’s see what else this plucky tool has got up its sleeve. The temperature – One of the major assets of this particular model would surely be its surprisingly massive temperature range, especially when you take into consideration its size. The thing is, this model will go from 0 all the way to some 500 degrees Fahrenheit, which is quite impressive if you compare it to some other models on this list. Teflon-coated heat platen – Similarly to some of the presses you’ve already seen in the entries above, the ePhotoinc’s Swing-away model also comes with a Teflon-coated platen. Great heat transfer, things don’t get stuck, burnt or otherwise ruined- what’s not to love? The power input – When it comes to making this machine come to life, all you’re going to need is a standard 110-Volt US plug. (That’s also grounded) Simply stick in the power cord and start making some wicked designs! The timer – For this model, folks at ePhotoinc have decided to go with the standardized timer that goes from 0 – 999 seconds. So, you have plenty of space to time your imprinting undertakings to exactly the period you fancy and get optimal results every time, hopefully. Boasting a high-quality black finish that gives this machine an appearance that could even be described as elegant, the ZENY Digital Heat Press is really a contraption that means business. Also, it comes with a variety of supporting parts, so to speak, which have been put in place with the goal of keeping this machine as efficient and user-friendly as possible! Check out the passages below to find out more about them. Thickened heating platen – Since temperatures that help make an imprint on your object of choice can get pretty high on this device, it’s good to know that the top part along with the heating platen that’s built in it is properly insulated. It’s thick enough to handle whatever temperature you set on this machine, so you don’t need to worry about it damaging the goods in question. Conveniently-placed indicator – If you happen to be the type of person who tends to forget to turn off their iron or stove, this model from ZENY might be the perfect solution for you. When the imprinting process is finished, the indicator will let you know, so you won’t need to worry about your beloved T-shirt getting roasted or otherwise damaged! The heat plate – The material for the actual heating element that the manufacturers decided to go with for this model comes in the shape of an aluminum plate. It’s got excellent heat-transfer properties and can cool off relatively quickly once the imprinting process has been completed. 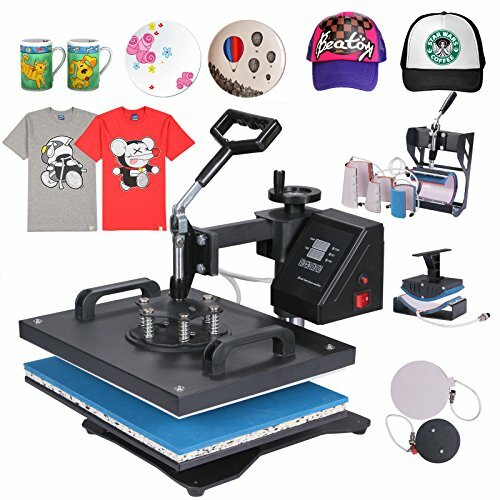 Featuring a sizeable roster of attachments that counts as many as 8 different items, this heat press is an all-you-can-eat buffet of making imprinted designs, so to speak! The frame of this model is pretty sturdy, as well, and can withstand some high-temperature undertakings without acting up. Moreover, the price of this model isn’t really that much higher than that of some similar models, so if you fancy having an imprinting machine with a bunch of useful attachments, you might want to consider obtaining this particular one. Keep reading to find out about its other features. Adjustable balancer – One of the problems with operating a heat press is that the pressure might not be distributed evenly across it, resulting in a botched end-product. Therefore, the good news with this model is that you get an adjustable balancer to keep it in line at all times. This means you’ll get a perfectly-imprinted object each time with no smudges or other annoying imperfections. 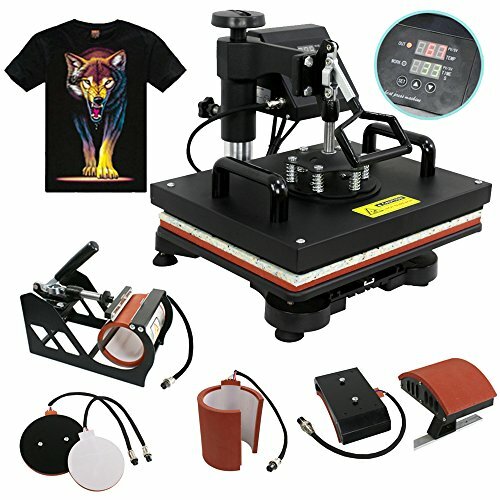 A number of possible imprinting tasks – Equipped with no less than 8 different attachments, this T shirt heat press review from eco-globe.com can help you choose from a wide variety of designs. That would include T-shirts, mugs, plates, mouse pads, jigsaw puzzles, you name it! 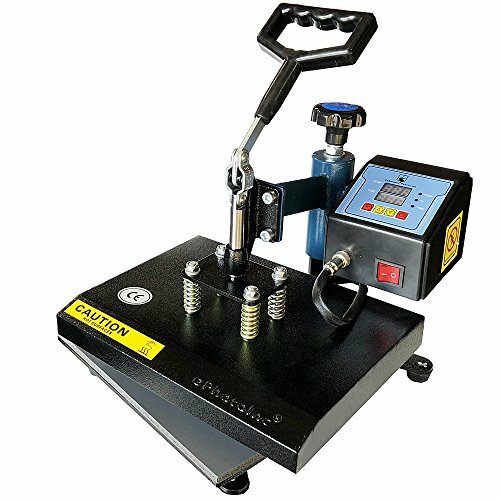 The frame – Ensuring longevity and reliable handling, Mophorn’s 8-in-1 heat press machine possesses a sturdy steel frame able to survive a nuclear blast. The power output – When it comes to the wattage of this contraption, you get some 1,400 Watts of sheer imprinting power- more than enough to make new designs and logos six ways till Sunday and still keep going! Yet another powerful imprinting contraption from the now already well-known Fancierstudio comes in the shape of the Swing-away Heat Press, and as its rather self-explanatory name suggests itself, this one’s got a springy swing-away design going on for it! The construction itself is rather simple, so handling shouldn’t represent that much of a problem, even for a complete rookie. All you have to do, really, amounts to typing in the values of your choice, and then swinging the top part onto the lower section for some immediate results of imprinting magnificence! 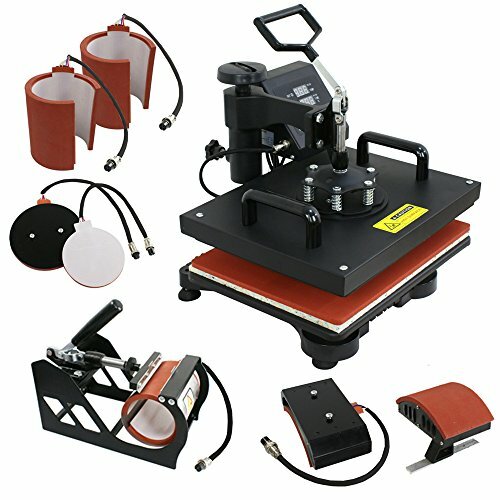 Teflon-coated heating platen – Similarly to the model you’ve already seen described on this list, the Swing-away Heat Press from Fancierstudio also comes with a Teflon-coated top part. This ensures that the objects of the imprinting process won’t stick to the surface, which can be pretty detrimental to the overall ‘well-being’ of the item in question, so to speak. The Temperature – As far as the temperature range of this particular contraption is in question, it goes from 0 to 500 degrees Fahrenheit, leaving you plenty of room to make a whole lot of different designs. All you need to do would amount to a couple of easy adjustments then! What’s not to love? The Timer – As is the case with the vast majority of the heat presses you’ve had the chance to read about in the entries above, this model, too, comes with a timer that goes from 0 – 999 seconds. This parameter can also be easily set using the small board that comes attached to this device. The Power Output – If you were wondering about the amount of power this particular contraption would be capable of exerting, the exact number would be 1,400 Watts. This can comfortably cover the imprinting process for a wide variety of objects, so you can rest assured that whatever design it is that you had in mind of making, you can definitely pull it off using one of these mean machines. Alrighty then! Now, even though making a heat press machine do its job isn’t really rocket science, there are still some steps you should always follow in order to keep your workspace safe, and avoid burnt apparel, or, worse still, burnt body parts. The Preparatory Work – Since most heat presses offer different attachments for a wide variety of possible designs, there will be some parameters that need to be set before you can start working. Namely, you should be aware that each of the items you want to make an imprint on needs to be treated individually. What this means is that you’ll need to set up the temperature and the timer each time you want to use it. Secondarily, you need to set the timer. The time that an imprint needs to catch on can vary from 15 to 60 seconds. You must be extra careful when settings this value up, as a couple of seconds off can make your shirt all burnt and unusable or otherwise poorly imprinted. Again, our advice would be to take your time and read carefully through the instructions. All things considered, owning a heat press machine can be loads of fun. Using one of these, you can print out some wacky logos, the name of your favorite team (watch out for that copyright though), or some cheeky messages for passers-by! To conclude this series of reviews, we’d like to say that each of the models you’ve seen above is a valuable machine in its own right. So, whatever model you decide to go for, you’ll be sure to end up with a mighty imprinting contraption on your hands. We wish you a merry and hassle-free purchase, cheers!